To determine if the best predictor of pregnancy complications is pre-pregnancy body mass index (BMI) alone or in combination with other factors. 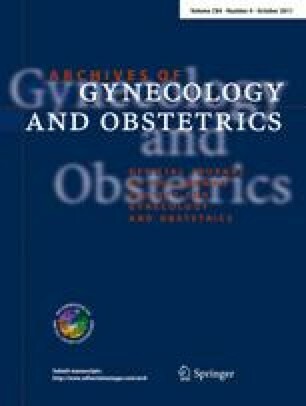 BMI and peripartum outcomes of singleton pregnancies were evaluated. Recursive partitioning and logistic regression modeling was used. Of the 4,286 cohorts, 26% were obese (BMI >30 kg/m2) and, compared to cohorts with normal weight, at risk for wound infections (P < 0.001), and shoulder dystocia (P < 0.001). High-risk patients (15%; BMI >32.5, parity, pregnancy weight gain of 28 lb by 28 weeks) were at increased risk for wound infection (P < 0.001), endometritis (P < 0.001), shoulder dystocia (P = 0.001) and 5 min Apgar score <4 (P < 0.041) and at lower risk for pre-term delivery (P = 0.007). Since BMI, parity, and weight gain until 28 weeks together provide better prediction of peripartum complications than BMI alone, these characteristics can be used to triage and refer patients. Presented at the Annual Meeting of the South Atlantic Association of Obstetricians and Gynecologists, Naples, FL, January 11, 2010. The views expressed in this article are the view of the author and do not necessarily reflect the official policy or position of the Department of the Navy, Department of Defense, or the US Government.